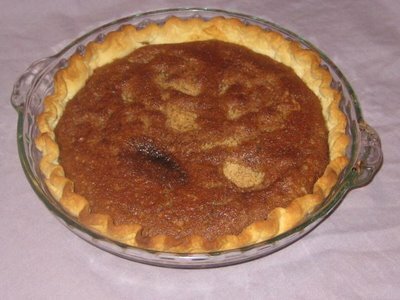 This recipe is a twist on the authentic American Shoofly pie that comes to us from the Pennsylvania Amish, Mennonites, and Pennsylvania Dutch; we shall be grateful to them forever. Preheat the oven to 350 degrees. Roll out the pie pastry and line a 9-inch pie pan; set aside. In a food processor bowl, combine the flour, brown sugar, butter, and salt. Remove one-half cup of the mixture and set aside. Transfer the rest to a medium mixing bowl. In a small bowl, beat the egg lightly. Add the molasses and cold water, and blend but do not beat; you don’t want bubbles in the batter. Set aside. In a small bowl, mix the hot water with the baking soda and blend into the molasses mixture. Add to the flour mixture and mix well. Pour into the pie shell and top with the reserved crumbs. Bake for 35 minutes. The pie will appear quivery but will firm up as it cools. Transfer to a rack to cool completely before cutting.